Aloha Friends! I'm sorry to have been MIA on the blog for the past few weeks. A combination of sick co-workers, climbing waterfalls, the Olympics, whales and happy hour may be to blame. I'm also getting ready for my....wait for it....first trip back to the mainland. Yes. I've acclimated enough to Hawaii that the word mainland is part of my regular vocabulary. I'm excited to see friends and family, go to Trader Joe's, and hit up stores like Kohl's and New York and Company that aren't on Maui. I'm also probably going to have to wear socks. I've pretty much given up on socks as an article of clothing except for the gym. But enough about socks. On to cookies! I've never purchased coconut oil before, much less baked with it. 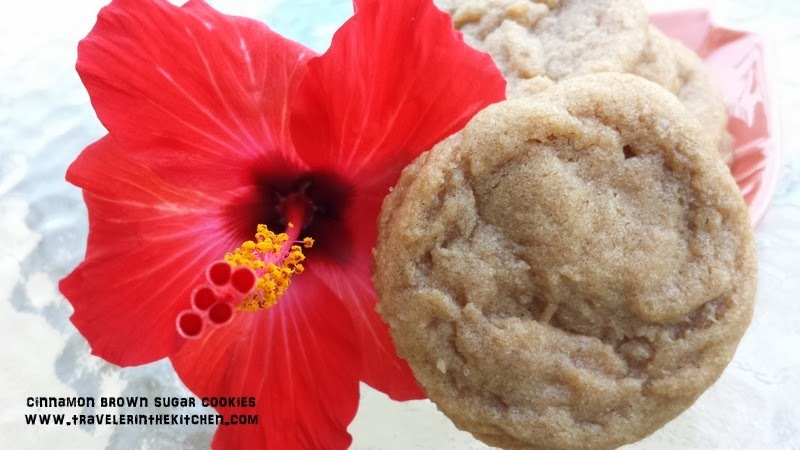 And then, I saw this recipe for Brown Sugar Cinnamon Cookies over on Sweet Treats and More. Hop on over to check out the recipe. I didn't make any changes or modification this time, since the whole coconut oil thing was new to me. Coconut oil stays solid.....until you get to an average temperature of 75 or more. Since I'm in the tropics, just sitting in my cabinet, the oil returned to liquid. I put it in the freezer to firm it back up, just in case it made a difference in the recipe. And for those of you who are living places where the winter this year is never ending, like my family in Wisconsin who are enjoying record amounts of days below 0....I hope that March really gets to the lamb stage early. That weather is crazy.